This is the vegetarian (or vegan, depending on the wine you use) version of my classic Turkey Bean Pot-au-feu! 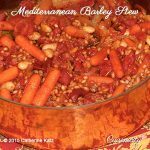 It has all those wonderful Provençal flavors of red wine, garlic, onion, tomato, carrots, cannelini beans and herbes de Provence (of course! ), but I use barley instead! My goodness….yum… it fills my kitchen with those wonderful aromas when I make it, much to the delight of my family and guests! I make it for you in my own kitchen in this cooking class video here! Heat olive oil in a large shallow pan and sauté the onion and garlic for a few minutes. Add the dry barley to the pan and stir to coat well with the olive oil. Add the red wine and simmer for a few minutes. Add the drained sundried tomatoes, canned diced tomatoes (with their juice), baby carrots, herbes de Provence, bay leaves and salt to the pan and continue to simmer, uncovered for 30 minutes. You may have to add up to 1 cup of water if needed (you'll have to be the judge of that, so pour it slowly, a little at a time, don't worry, you'll know!). Add the drained canned beans, gently stir and continue to simmer for an additional 15 minutes. Serve with fresh thyme over cooked farro or quinoa. My husband is supposed to cut down on his carbs, so I have been looking for healthy. tasty recipes. 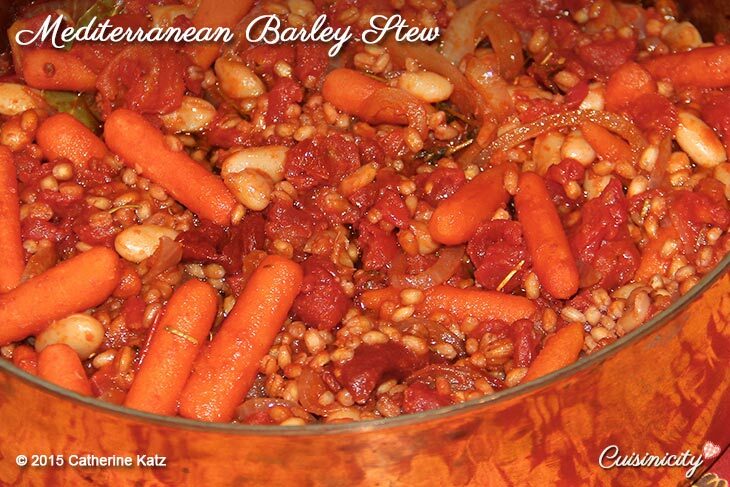 He doen’t much like barley, so I left it out, and made this simply a tasty veggie and bean dish, which we both enjoyed very much. Thank you! I am so thrilled to find such a lovely and delicious recipe that is good for him. I can see putting other vegetables in, too, like squash or cauliflower. yum. If anyone is worried about herbes de Provence, Our current jar is rather strong on the lavender, so I used 2/3 the amount called for, and added some marjoram and a bit more thyme. Again, thank you for your wonderful recipe. I am excited about others I will find here. What an amazingly tasty dish. We will keep this recipe forever! Helps that I get a glass of Chianti while cooking – bonus!